How do you rate your snooker skills? 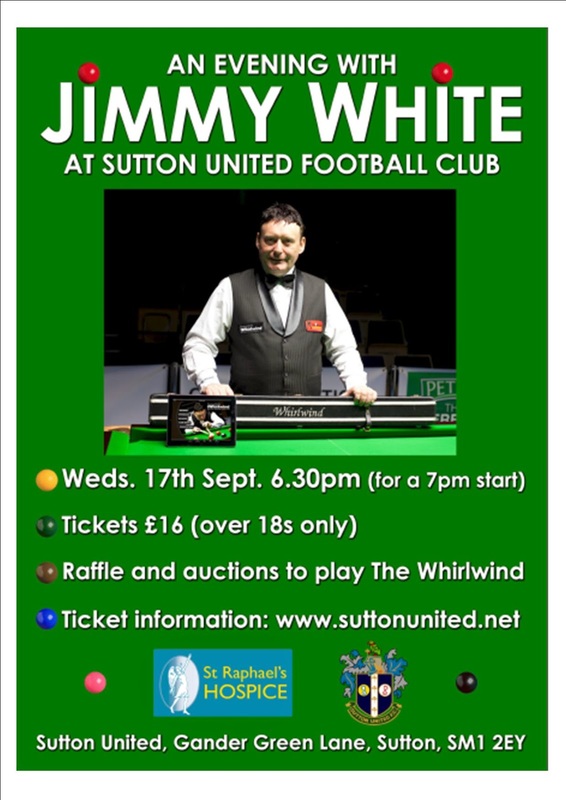 This Wednesday (17th September) one of Britain's Snooker greats, Jimmy White has agreed to play 9 frames of snooker with lucky members of the public at Sutton United Football Club. While this event is not being held in Worcester Park it is not too far away and is of direct benefit to an institution deeply connected with Worcester Park, St Raphael's Hospice. Doors open at 6.30 for a 7pm start. Everyone who buys a ticket will have the chance to bid to play a frame against Jimmy with the seven highest bids winning. You can bid prior to or on the night. Frame 8 will be raffled on the night and frame 9 will be auctioned on the night. All proceeds of the night will be split between St Raphael’s and Sutton United Football Club.